I came across the “Livescribe 3 smartpen” in a technology magazine the other day. Made by Livescribe, the pen records handwritten text and pictures from (special) paper to a smartphone or tablet. Write on “Livescribe dot paper” using this special pen and the same thing appears in electronic form on the smartphone or tablet. The device pairs uses Bluetooth 4.0 to pair with a smartphone or tablet that is running the Livescribe+ mobile application. The application is integrated with tasks, reminders, calendar, and contacts. It also provides handwriting-to-text conversion, the option to include audio recording that is synced to the user’s handwriting, the ability to tag snippets for further organization, and the creation of .pdfs for sharing. Livescribe 3 smartpen sells for $149.95. I have not used the pen myself, although it has received numerous reviews from PC Magazine, Engadget, New York Times, CNET, and is available for sale on Amazon. Note that the user reviews are not that terrific. 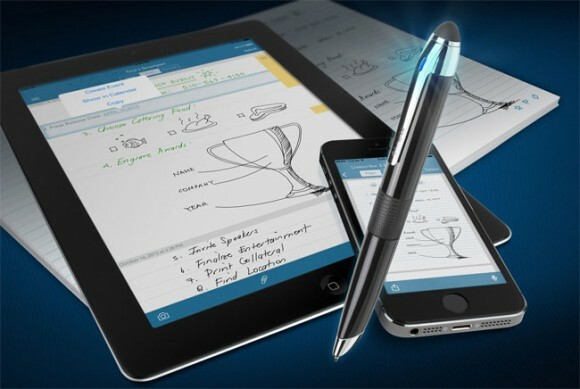 The Livescribe 3 smartpen is clearly aimed at note takers, rather than writers. However, I know a few writers who still compose using pen and paper and could benefit from having a smartpen to expedite the transfer of their words into electronic form. However, I wonder if it wouldn’t just be easier to type on a keyboard and draw on a touchscreen. Hmmmm….